Genomes are packaged as chromatin in nucleosomes composed of core histones (H2A/H2B/H3/H4). Epigenetic processes, mediated by histone post-translational modifications, allow continued gene expression/repression in cell lineages. Understanding how such ‘marks’ establish and propagate chromatin states is critical for specifying and maintaining distinct cell types. Moreover, epigenetic states provide a source of phenotypic variation, independent of DNA sequence. 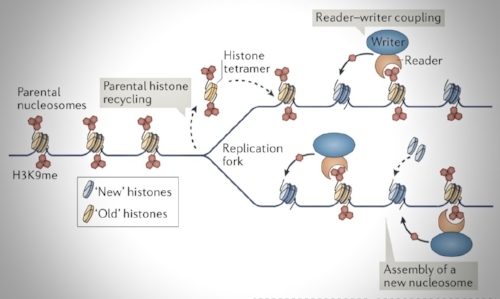 Lineage commitment and reprogramming of cell fate involves both chromatin-mediated shutdown and activation of elaborate transcription programmes. Specialised chromatin domains are therefore fundamentally important, but dissecting these epigenetic mechanisms remains challenging in mammals. Model organisms such as fission yeast are effective for uncovering important principles applicable across phyla. Epigenetic heritability is an important property of both heterochromatin and CENP-A chromatin: once formed they can persist without initiating signals. Since debilitating disorders (i.e. Friedreich’s Ataxia, FSHD) result from aberrant heterochromatin-mediated gene silencing, it is important to understand events that promote and deter gene silencing. Moreover, stochastic gene silencing in response to environmental cues may trigger transgenerational inheritance of epigenetically-regulated traits. Functional CENP-A chromatin is assembled only at centromeres; chromosome missegregation and aneuploidy result from defective CENP-A and kinetochore assembly. Regulated CENP-A deposition prevents unstable chromosome formation by ensuring assembly of only one kinetochore per chromosome. Overexpression of CENP-A and its assembly factors is prevalent in various aggressive tumours where they may drive genome instability. Our goal is to decipher conserved mechanisms that establish, maintain and regulate assembly of heterochromatin and CENP-A chromatin domains. We aim to provide provide insight into how heterochromatin forms on canonical pericentromere repeats. Heterochromatin may also silence genes throughout the genome, we are investigating how stochastic silencing might exert epigenetic influences on phenotype. We also strive to understand how heterochromatin, spatial nuclear organisation and non-coding RNAPII transcription combine to mediate CENP-A incorporation at centromeres. Trypanosome epigenetics: in collaboration with Keith Matthews we are investigating the nature and function of heterochromatin in the sleeping sickness parasite, Trypanosoma brucei. The Wellcome Centre for Cell Biology is located in the Michael Swann Building (tall light cream/green building on the King's Buildings Campus, ~4 km south of the city centre. The Michael Swann Building is the third building, approximately 100m, on the left through Entrance 4 from Mayfield Road and can be reached from the city centre by bus or taxi. Taxi: fare from Edinburgh airport is ~£25 GBP and from Edinburgh city centre ~£10 GBP, depending on the traffic conditions. Bus: Lothian Buses provide an express Airlink service to/from Edinburgh Airport to the city centre and operate a network of buses around the city. Services 42 and 67 leave from the City Centre/Princes Street and stop close to Kings Buildings on Mayfield Road. Other services such as the 3, 7, 8, 29, 30, 31, 37, 47 leave from the city centre and stop at Cameron Toll which is approximately 10 minutes walk away from the Wellcome Centre for Cell Biology. By Air: There are regular direct flights to Edinburgh from London, Amsterdam, Barcelona, Frankfurt, Paris and other European cities. There are direct flights from New York (Newark - Continental; JFK - Delta). For more information see Edinburgh Airport. Edinburgh is only 50 miles from Glasgow and Glasgow Airport. By Train: There are excellent train services Edinburgh-Glasgow and Edinburgh-London Kings Cross. Post-Doctoral Researcher and Ph.D. student applications from UK, EU, US & Overseas are always considered. Post-Doc fellowships: EMBO, FEBS, HFSP, Newton, Marie Curie, Wellcome. PhD Studentships: Darwin Trust (email me), Edinburgh Global, Principal's Career Development, EastBio, Precision Medicine, Boehringer Ingelheim Fonds.